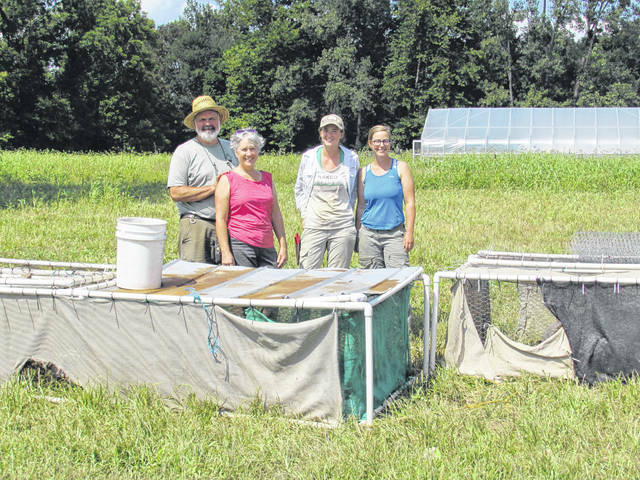 Left to right, Guy Ashmore, Sandy Ashmore, Laura Kington, Rachel Metzler, with the eight chicken tractors. In August the Ashmores brought 150 chickens to the family farm, where they will be raised as pasture poultry and butchered in October. The chickens at That Guy’s Family Farm live in chicken tractors, which are basically movable chicken coops that allows chickens to move freely across the land while being protected from predators. The chickens are a mixture of hens and roosters. That Guy’s Farm and Flower Store, displaying freshly-picked tomatoes from That Guy’s Family Farm. Editor’s note: This is the fifth in a series of monthly articles following a farm family through the course of a year. This year, Rural Life Today is following the Sandy and Guy Ashmore family in Clinton County. CLARKSVILLE—Chickens fertilizing the land and fall crops in the ground, Guy and Sandy Ashmore are gearing up for fall. This month the Ashmores brought 150 chickens to the farm. They do this every year. But this year Laura Kington and Rachel Metzler, That Guy’s Family Farm apprentices, helped repair the coops, are learning how to care for the chickens and will even learn the butchering process. Neither apprentice has previously worked with chickens. Rachel and Laura will assist and learn during the butchering process at the beginning of October. Before then, they both will be going to another farm in Granville to learn about the process, which was arranged through the Ohio Ecological Food and Farm Association (OEFFA). Rachel said that she’s surprised at how fast the chickens are growing. At the beginning of October, the chickens will be at about 8 weeks old and ready to be butchered. The chickens live in chicken tractors, which are basically movable chicken coops that allows chickens to move freely across the land while being protected from predators. The chickens are a mixture of hens and roosters to have a variety of poultry sizes, with hens usually around 4 pounds and roosters at 5 pounds. Guy’s grandmother helped butcher chickens on their farm until she was ninety-one years old. “She really taught us the basics,” said Sandy. Guy said that they wanted their own meat and he mentioned the Joel Salatin method of raising pasture poultry seemed to fit their land and workforce. “Then we went to the OEFFA conference in 1994 and heard Joel Salatin of Polyface Farms (Virginia) talk about pasture poultry and that it’s something you could get into without big expense or infrastructure,” said Guy. The Ashmores also use the chicken manure as fertility for their crops. Guy and Sandy used to raise, butcher and sell poultry commercially. Now they raise, bucther and process about 150 chickens once per year for themselves and their family. Guy and Sandy have always had an open door policy at their farm, adding that other farmers have helped them in the past. They’ve had several people at their farm over the years who have learned about butchering chickens by visiting their farm. That Guy’s Farm and Flower Store is also a testament to their open-door policy. The store sits at the front of their property and is full of fresh produce and flowers. The store operates with an honor system, so people can stop by and purchase at any time. Both Rachel and Laura used to be vegetarians. “When I started eating meat again, I decided if I’m going to eat meat, I want to understand the whole process and make sure that I’m not participating in something that I don’t agree with,” said Laura, adding that being part of this process will enable her to understand it fully and appreciate all the work that goes into it. Rachel grew up a vegetarian and didn’t eat poultry until she was in high school. “That was largely because my family was concerned about the welfare of the animals and you couldn’t readily find good-produced meat that was affordable,” said Rachel. Now Rachel purchases meat from local farmers and largely through farmers markets. “I’m very excited to be part of the whole life of the animal because that is part of their life and part of why they were raised,” said Rachel. The OEFFA program that Rachel and Laura are part of has ended now, but both apprentices will stay on That Guy’s Family Farm until November. Laura and Rachel are apprentices at That Guy’s Family Farm through the OEFFA Begin Farming Program. For more information visit policy.oeffa.org/beginfarming. “It’s good for people [who eat so much meat] to see the whole cycle, not that you just order it from the fast food line. 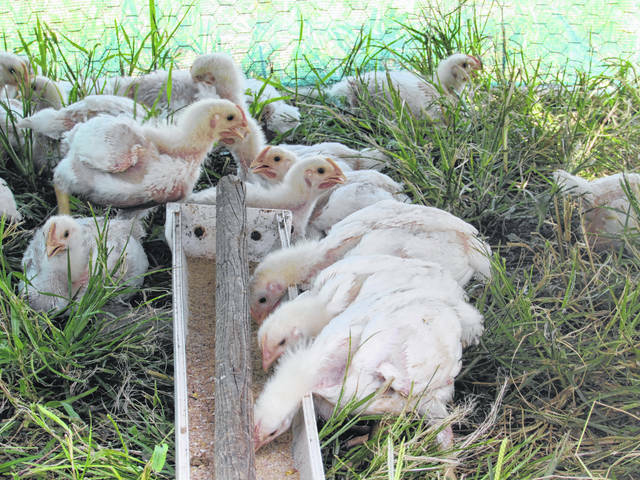 We try to raise animals as best we can and we like to have whole control of it, even the processing,” said Guy, adding that it’s good for people to be self-sufficient. If someone is searching for locally raised meat, Guy said that the OEFFA Good Earth Guide (www.oeffa.org/search-geg.php) is a good source. Sandy added that East Wild Ohio Directory of Farms is also a source to find locals farms (www.eatwild.com/products/ohio.html). Guy added that just about any farmers market will have a local meat vendor. Sandy explained how grass-fed and good feed really makes a difference. The Ashmores get their non-GMO (genetically modified organisms) chicken feed from Highland Naturals out of Holmes County, OH. They also said that the smell when they open up the bird it “totally different” with chickens who were fed commercial feed versus non-GMO feed, and chickens that were raised on grass, instead of confined areas. August was full of summer harvesting, and a little more rain. The rain didn’t take out any rows of crops, but the downpours did hinder them from planting. “It’s still been pretty wet. We’ve still been struggling to get things on schedule,” said Guy. Sandy added that they have’t lost any crops to the rain, but they haven’t been able to plant some that they might have lost. They have Brussel sprouts, cabbage, kale, collard greens, and carrots in the ground, and planning for more. They will harvest fall crops the beginning of October, starting with the winter squash and sweet potatoes. The fall crops will be stored and put away for their winter CSA (Community Supported Agriculture), which will start the first Wednesday of November and will go through February. They conduct a winter CSA pickup business, consisting of about 50 clients, as well as a summer CSA with around 30 clients. Guy said that their tomato crops surprised him with how well they turned out. He said that they didn’t look so good at the end of June, but they ended up doing well. “The beets have done tremendous,” said Guy. “They never missed a beet.” Other crops that turned out really well are zephyrs (summer squash), popcorn, garlic, in addition to some others. However, winter squash and potatoes have been a struggle this year. And there was a lot of lettuce that couldn’t be planted because of the rain. “Eggplant was a bust,” said Laura. Flea beetles have been relentless this year, according to Sandy. She added that they should be done by now in the season. The Ashmores plan to have the last of their winter crops planted before the Persephone Days, when there are less than ten hours of daylight. Guy said that begins November 15 and then won’t get more daylight hours than that until January. So they will have all winter crops planted by the end of September. Laura and Rachel are also helping the Ashmores relocate a tunnel to a better spot on the farm. The plan is to also transition a hoop house into a greenhouse by October, which will be heated throughout the winter. Next month: Farmers market and the fall season. https://www.rurallifetoday.com/wp-content/uploads/sites/56/2018/09/web1_AshmoresApprenticesChickens-1.jpgLeft to right, Guy Ashmore, Sandy Ashmore, Laura Kington, Rachel Metzler, with the eight chicken tractors. In August the Ashmores brought 150 chickens to the family farm, where they will be raised as pasture poultry and butchered in October. https://www.rurallifetoday.com/wp-content/uploads/sites/56/2018/09/web1_ChickensUpClose-1.jpgThe chickens at That Guy’s Family Farm live in chicken tractors, which are basically movable chicken coops that allows chickens to move freely across the land while being protected from predators. The chickens are a mixture of hens and roosters. 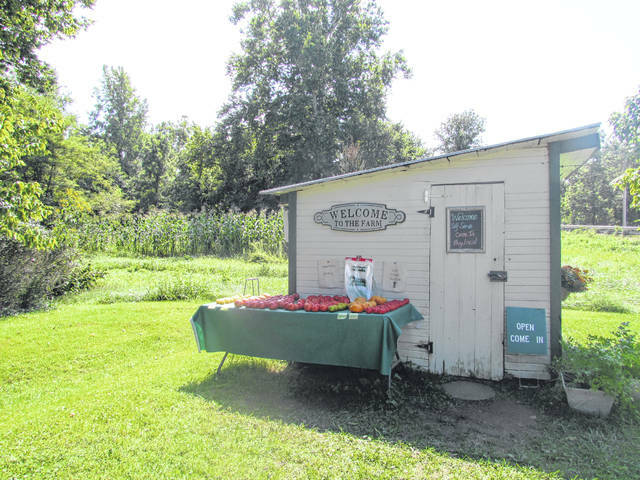 https://www.rurallifetoday.com/wp-content/uploads/sites/56/2018/09/web1_Store-1.jpgThat Guy’s Farm and Flower Store, displaying freshly-picked tomatoes from That Guy’s Family Farm.